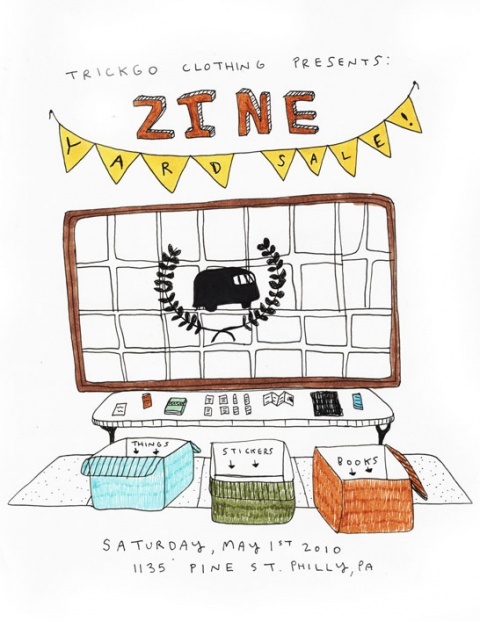 TrickGo Zine Yard Sale – May 1st! Come join us at our Pine Street store May 1st for our first TrickGo Zine Yard Sale – May 1st! Space 1026ers Holly Holly Hobby Hobby, Greg Pizzoli and Mark Price’s Zine of The Month Club will all have tables and will be selling their ‘zines along with titles from Mike Gerkovich, Cantab Publishing, Matt Leines, Free News Projects, Bonnie Brenda Scott, Andrew Jeffrey Wright and more. This Saturday, May 1st from 12 – 4pm at 1135 Pine Street. You can read more in the City Paper.